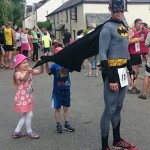 Richard Lander-Stow - Ultra Runner, Ironman Triathlete - All dressed as a Superhero! I pottered on with my training for a few years without making any real progress. Eventually an unrelated issue meant that I lost some weight and my pace started to pick up, but it soon plateaued and with my whimsical nature towards racing (everything and anything from 10k to ultra marathons to cycle sportives and triathlons) I never really saw much improvement anywhere. For 2014 I had some fairly serious goals involving several ultra marathons and then a switch in focus mid season to do my first Ironman in Wales. I decided that I needed some help and after bumping into Neil at one of my tri club training sessions, where he had been drafted in to do some running video analysis, he seemed like the obvious choice. I generally ask a lot of questions and knew that any coach would need to be extremely knowledgeable and able to field my never ending barrage. After several further conversations with Neil he started coaching me at the beginning of December 2013 and I haven't looked back since. In the first 9 months my swimming, cycling and running have come along to levels where they are higher than they have ever been, even when I used to train them individually. I am also stronger than I have ever been and to be honest my brain has struggled to adjust to my new found levels of fitness. I still see myself as the slightly overweight dude on the starting line who finishes towards the back of the race. Now I routinely finish in the front third of the field, whatever event I am racing in, and I have a level of endurance that I could only imagine twelve months ago. Just a couple of weeks ago I finished in the top 20 at the Frome half marathon, smashing my two year old PB by 3 minutes. I then followed this last weekend with a great performance at the Ocean Lava Triathlon where I bounced back from a mid race nutritional issue to finish 83rd of 267 starters. I easily completed my first Ironman experience in Wales and cannot wait for more. With Neil's experience and expertise I have learnt a lot more about pacing, fuelling and running mechanics and on occasions where I have metaphorically stumbled Neil has helped me up and onwards, tweaking my schedule where necessary and being in regular contact to keep me moving in the right direction.